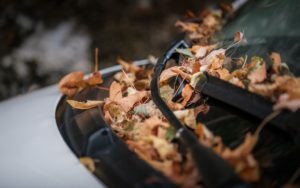 Tend to your car to get it ready for autumn roads. The weather is cooling down and fall is here. While we may be preoccupied with all things orange, pumpkin-spiced, and spooky for Halloween, it’s important to remember that our vehicles need to get ready for the season change ahead. Since October is Fall Car Care Month, we’ve rounded up a few of our top tips to help you get your vehicle ready for the cooler weather. The cold weather and harsh conditions can negatively impact a car’s battery. Check the battery and the charging system. If your battery is in need of an upgrade soon, it’s wise to get a new battery before winter. It’s recommended to replace batteries that are more than three years old. Be sure to keep the battery connections clean, tight, and corrosion-free, too. Your tires are what keeps you safely on the roads. Before the slick road conditions arrive, inspect your tires. Are there bald patches? Are there cracks in the sidewalls? If your tires are looking worse for wear, get a new set. Consider getting special tires that maintain traction with the road even on ice and snow. Remember to keep the air pressure of all the tires at the recommended amount as tires can quickly lose pressure in cold conditions. Check that the heating and air conditioning system is working well since you will need it for adequate defrosting on those early mornings! Fall is a great time to check your air filters, too. Inspect your wiper blades. If they are breaking and leaving smudges on the windshield, pop on a new set so that your visibility isn’t hindered when it’s raining. Your brakes are so important, yet we forget about them often. Take your vehicle to your local mechanic to be sure that the brakes are in good condition. Ask them to check the brake linings, rotors, and drums, too. On icy and snow-covered roads, effective brakes are critical. Your car insurance helps to keep your vehicle safe throughout the seasons. Contact the professionals at Abbate Insurance to secure the right auto insurance for your vehicle in New Haven, Connecticut. Our trained experts can match you with the right policy to suit your journey, needs, and vehicle, all at the right price.